I wasn't sure what to call this but I found a recipe for Southern Gravy that was flour and milk so I went with that. I started in the afternoon deciding to make 10 grain bread. I got out my french bread recipe, swapped 1/4 cup 10 grain cereal for 1/4 cup flour and adding a tablespoon of molasses. It worked but a couple of things I could have done would have made it much better. I cook for two people so my recipes are always for small amounts. Turn oven light on, the light alone warms the oven to the perfect temperature to rise bread and make yogurt. Warm the water to 35C or till it feels neither warm nor cold when you stick your finger in it. Yeast likes the same temperature your body does. Add the yeast and struggle a bit to get the lumps out. No doubt there is an easy way to do this I have yet to discover. I let the yeast rehydrate for a few minutes before making the dough, it seems to work much better. If I had put the cereal in the water first the soften up for a couple of minutes it would have produced a better result. I'm not sure if I have to add more water for this, we'll have to see next time. Put water in stand mixer bowl. Add wet then dry ingredients. Lower dough hook. Turn mixer on for 5-10 seconds then turn off for 5 seconds. Repeat this until all ingredients are taken up. It makes better dough than just turning the machine on. Once the dough has been made, increase the speed and let it run so the dough is slapping against the bowl. The dough needs to be on the hook and stretched against the bowl by centrifugal force to be kneaded by the machine. If it's too dry it will form a ball and require hand kneading. Once the dough is soft enough to slowly stretch under it's own weight it's ready to go. It will be soft and supple. If it's firm it will bake into a rock. Put one tablespoon olive oil in a bowl, roll the dough in it and put it in the oven till it doubles in size, an hour or so. Remove from bowl, punch down or stretch into a roll or baguette and put on baking sheet. Let rise to double again. Remove from oven. Turn oven on and warm up to 375F. Bake for 30 minutes. Cool on a rack. Peel, dice and boil the potato then drain. Fry 3 strips bacon. Fry the onions in the bacon fat adding oil as needed. When the onions are caramelized add diced red pepper and celery. Sweat these vegetables then remove all from the pan. Fry the sausages so there is colour all around them. Remove from the pan. Turn heat in pan below medium and add flour and butter. Cook the flour in the butter for a minute or two. The longer it cooks the less it will thicken so go easier on the milk. Remove from heat and whisk in the milk and beef stock and add the corn. Put back on burner, bring up to a simmer, add thyme. 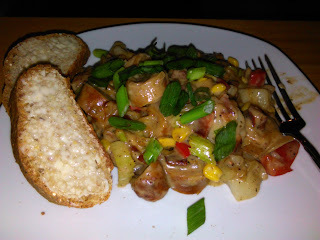 Chop sausage and bacon and add everything back into the pan including potatoes. Add salt and pepper to taste. When the corn is cooked and the gravy has thickened plate with sliced bread and enjoy!